SALT LAKE CITY — A man who died while canyoneering in Zion National Park has been identified as Yoshio Hosobuchi, 74, of Novato, Calif. 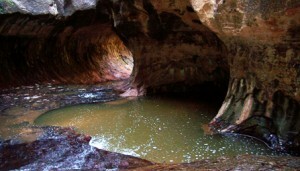 He and his wife attempted to descend the Left Fork of the North Creek, a popular route known as the Subway on Tuesday. On the last rappel in the canyon, Hosobuchi’s rappel devise jammed and he ended up hanging inverted in the waterfall and was unable to free or upright himself. His wife, who was already on the canyon floor below, was unable to assist him. A canyoneer from another group that just completed the Subway the same day, called park dispatch at 9 p.m. to let them know that there was a couple still behind them. The group had passed the couple earlier in the day and knew that at their current pace, they would probably have to overnight in the canyon. Based off that report, rangers began looking for the overdue couple on Wednesday morning. At 11:45 a.m., a ranger located Mrs. Hosobuchi, who was trying to get out of the canyon to find help. A search and rescue team hiked into the Left Fork and located Mr. Hosobuchi’s body Wednesday evening. Due to approaching darkness, his body was evacuated by helicopter Thursday morning. Hosobuchi was a retired neurosurgeon. He is survived by his wife and three children. Over the last few years, he and his wife have been traveling and completing a “bucket list,” which included completing the Subway. Last year he successfully hiked Kilimanjaro. The Hosobuchis were relatively new to canyoneering. Their only experience had been an introductory course and completing a trip through Zion National Park’s Keyhole Canyon. Unfortunately, they hadn’t mastered route-finding. Without looking at the route guidance they brought, the couple chose an anchor that forced them to rappel down the waterfall rather utilize the anchor listed in the route description. Rappelling in a watercourse increases the difficulty and may have contributed to Hosobuchi’s death. Based on the increased difficulty of the rappel, they might not have had all the skills necessary to get out of trouble while rappelling.